At our clinic in Istanbul, we use a special formula solution rich in Biotin for the preservation and nurturing of the extracted hair. Immediately following extraction, the single hair groups (grafts) are immersed in our specially developed formula solution, and they remain there until they are re-implanted. The containers are kept in cold storage, which slows down the degradative intracellular processes – while the hair roots are in the cold, the degradative intracellular process cannot take place. The special solution also provides nutrients to hair roots and stimulates the growth process of the cells, thus directly counteracting the degradative intracellular processes. The combination ensures fresh hair roots which can adapt themselves to their new environment. Everyone wants healthy and shiny hair. A lot of you realize this, after they lose their hair. There are several reasons for hair loss like hormonal or genetic reasons. Call us or contact us via Whatsapp or E-Mail. We will consult you extensively and without any charges. You got consulted in an excellent way and you are amazed by the offer we made? The next step is to make an appointment! Once you got an appointment, you have to book the flights and send us all required information to organize everything. Our packages include everything you need in Istanbul: Hotel, Transfer, Interpreter etc. Our staff is full of experts with long years of experience. They used to work with specialists. We offer a guarantee of 20 years for all our treatments. The percutaneous technique guarantees a higher growth rate. Asking will cost you nothing. Just as the consultation and the professional hair analysis. What are you waiting for? Contact us today, we would like to help your with your issues! Once you arrive to the clinic, we will do a preliminary examination. This preliminary examination contains a blood test and the analyze of your hair. For majority of our hair transplants it is necessary to cut the hair. In few cases it’s not necessary to cut off the hair. The FUE Hair transplant will be done under a local anesthetic, so that a pain-free and comfortable sitting can be guaranteed. After the extraction, the extracted grafts will be stored in containers filled with the own-developed solution. They will stay there till they get implanted on the receiving area of the head. The containers are placed on plates that keep them ice cold. The cold slows down the decay of the cells, while the grafts are cooled down, it comes almost no decay of cells. Despite that, the special biotin containing solution provides the grafts with nutrients and the faster growth of the cells. Bio Hair Clinic works in a team of specialist who can provide the best treatment for hair transplant in Turkey. We are offering the budget hair transplantation packages from 1299€. 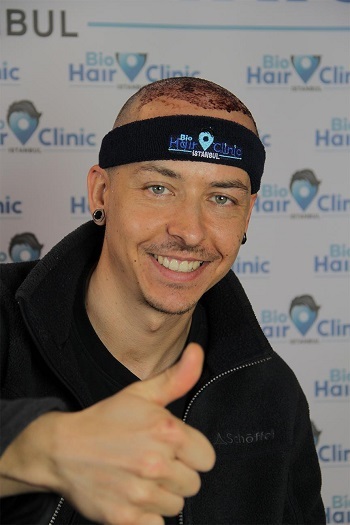 In our Bio Hair Clinic, we are backed by the high-tech equipment and all in-house facilities as we follow the modern hair transplant FUE technique to ensure the delivery of optimum results. We are known as the most recommended specialist for hair transplant surgery in Turkey with a special solution that ensures the full growth of new hair. At our certified clinic, you would get all sterile operating rooms, WiFi facility along with a TV and a single package includes hotel, transfer, PRP treatment, blood tests as well as examination. We have a team of plastic surgeons, a team of specialists as well as well-trained nurses who comply with the international standards. Our team is empowered by their immense hair transplantation experience in different result-oriented ways at very nominal prices.